Princess Cruises has announced its two newest ships, Sky Princess and Enchanted Princess, and they will have the largest balconies of any cruise line – indeed the largest balconies ever offered at sea. 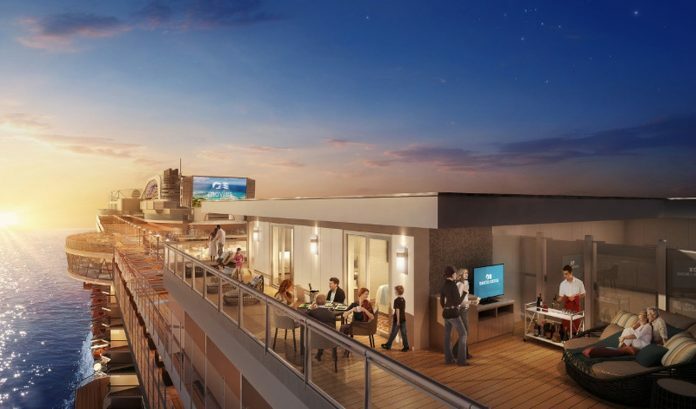 The two “Sky Suites” will be centrally located on the ships’ top decks, with one measuring 1,012 sq ft. and the other 947 sq ft. That’s the size of a tennis court! Each suite can sleep five with two bedrooms and two bathrooms and a dining area with skylight. There’s also a top deck Movies under the Start cinema screen which the suites have private access to. AI features include a ‘medallion-enabled’ piece of technology which is around the size of a 10p pice. Guests use this to gain access to their statement – no key needed – and streamlines their embarkation and disembarkation experience. This also communicates to the staff about guests’ preferences around food. There’s also a new jazz lounge, expanded theatre, a staggering 25 restaurants and bars, eight private cabanas in the Sanctuary, an adults-only area on the top deck and a spa with Princess’ largest thermal suite at sea. Sky Princess is due to launch in October 2019, sail a short season in the Mediterranean before heading to the Caribbean. Enchanted Princess launch in Southampton in June 2020 also sailing to the Mediterranean.